Mother’s Day is a very special day. We celebrate not only the gift of life that a mother bestows upon her child (with a little help from the father of course)…(Okay, so VERY little help of the father). But we also celebrate the wondrous link that follows a mother and child the rest of their days. You don’t have to give birth to a child to be its mother. Mother figures and moms a bound. I lost my own mother many years ago and when I met my dear wife, it didn’t seem to take long at all for her mom to become my mom. And when we lost her few years ago, the empty spot in our hearts is still there. You will always have a spot in your heart for your mom. Doesn’t matter how well you get along, she will always be your mom. And today is a great day to say thank you for all they’ve done. 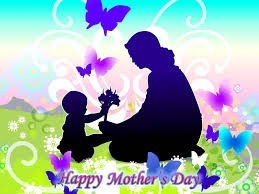 And to all of you out there who are mothers either biologically or otherwise, thank you. Thank you and I hope you have a truly marvelous day! Our love and best wishes to you all! Impish, Lethal and all the staff and friends here at our little house. Impish Happy Mothers Day to the biggest (size wise) Mutha I know!